The blank is glued to a piece of ‘softer’ wood such as pine, with a piece of paper between them. The grain of the pine should be adjacent to that of the blank. The face plate is screwed to the pine, ensuring as far as possible, that the face plate is central. The screws normally do not go into the blank, they are screwed into the pine only. 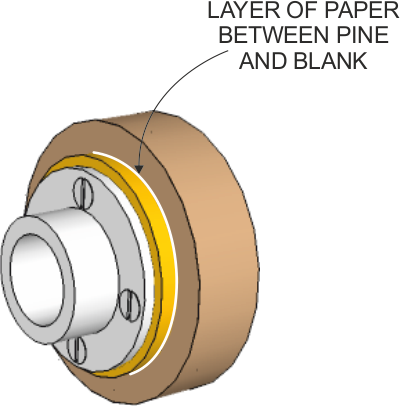 The blank is not a true cylinder when it is first placed on the lathe, as it has been cut on a bandsaw. This means that extra care should be taken when turning. 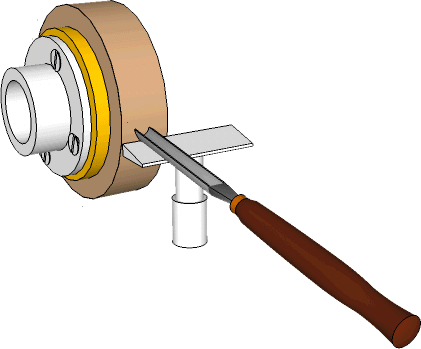 A gouge is used initially, to removed the waste wood, followed by at least one scraper. The type of scraper(s) used to form the external shape is determined by the required profile of the bowl.